American Aldes patented Zone Register Terminals (ZRT®) are designed to introduce flexibility and dynamic control to central ventilation systems. 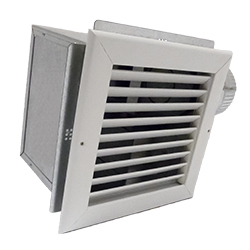 Used in both large and small systems, the ZRT regulates ventilation without the need for individual fans. Each ZRT is a combination grille, register box, control damper, and optional flow regulator(s). This unique combination provides up to four different control schemes without the need for expensive pneumatic, electronic, or DDC control systems.